For the dedicated angler, among the greatest anxieties of time spent by, on, or in the water is the gnawing ignorance of what bounties were just beyond his grasp—the ones that got away. For the dedicated musician, too, there are always questions about the boundaries of his repertory. There are not neglected masterpieces in every music library and archive, shrugging their shoulders and wondering why they are incapable of lifting themselves out of the shadows, but there are untold numbers of works still waiting to be discovered by artists with the particular gifts needed to disclose their finest qualities to observers whose skepticism is a natural-born offspring of unfamiliarity. 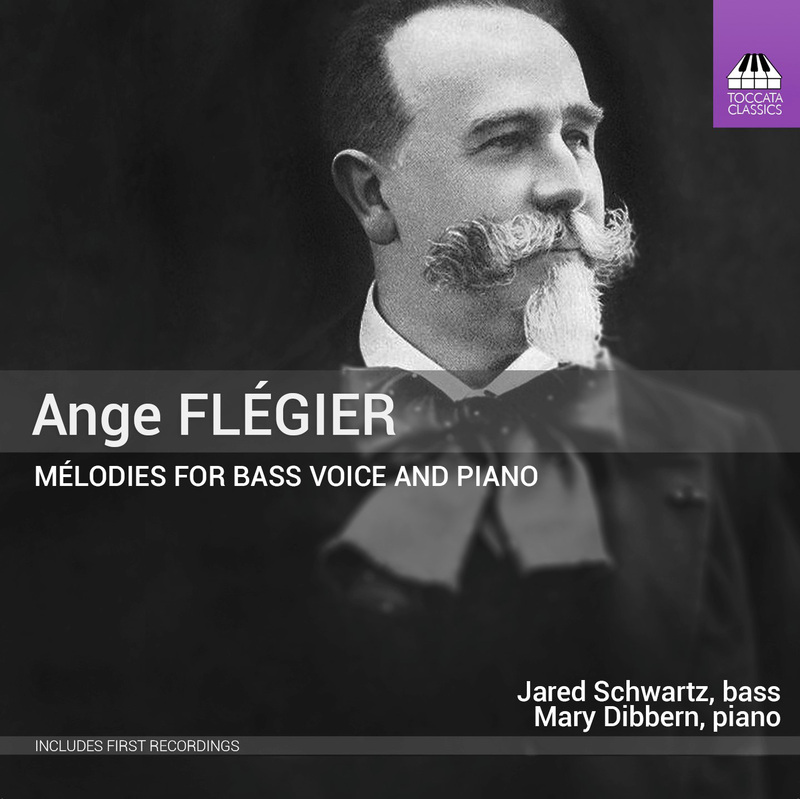 Recorded with mostly natural ambiance in the bright acoustic of Dallas’s Cathedral Church of Saint Matthew, this Toccata Classics disc unites superb-quality Mélodies for bass voice by little-remembered French composer Ange Flégier with American bass Jared Schwartz, a young Indianan whose singing on this disc is characterized by the qualities for which the music begs: clarity of mind, tone, and language. Not a newcomer to recording despite his youth, Schwartz nonetheless infuses this disc with an engrossing freshness that reveals far more than a thoughtfully-attained acquaintance with overlooked repertory. It is apparent in his singing here that, for Schwartz, music is not a casual paramour with whom he flirts but an adored mistress whose integrity he passionately upholds and increases. He and music are devoted lovers, in other words, and these accounts of Flégier’s Mélodies are their sweet kisses. Born into a working-class family in Marseille in 1846, Flégier was in some ways an unlikely candidate for a position of importance in France’s often fiercely competitive musical establishment. Following a period of study at the Conservatoire de Marseille, the young musician left his native city and in 1866 enrolled at the prestigious Conservatoire de Paris, where he encountered a number of the luminaries of French music of his time, including Hector Berlioz, Ambroise Thomas, and Daniel François Esprit Auber. Flégier’s music failed to take top prizes in the exalted competitions of the day, but it is worth noting that the names of the composers-in-training whose scores were victorious in the years in which Flégier’s compositions were their competitors are no more familiar to modern eyes than Flégier’s. Unless his dedications of his published works were exercises in well-aimed sycophancy, the Marseillais counted among his friends as discriminating a colleague as Jules Massenet, and neither the lack of historical documentation of extensive details of his youthful precocity nor the paucity of his works before the Twenty-First-Century public detracts from the undeniable quality of the Mélodies on this disc. Without question, these Mélodies reveal that Flégier was a tunesmith whose creations warrant comparison with the Lieder of Franz Schubert, Hugo Wolf, and Richard Strauss. Accompanied by pianist Mary Dibbern with abundant sensitivity and the complementary firm rhythmic core and interpretive flexibility that are at the heart of the music, Schwartz sings ‘Le Cor,’ a setting of a text by Alfred de Vigny and perhaps the most widely known of Flégier’s Mélodies, with focus that reveals the emotional nuances of the song without exaggerating them. No less insightfully communicative is his performance of Flégier’s treatment of de Vigny’s words in ‘La Neige,’ the distinctive sounds of French vowels used to highlight the intelligence with which the composer translated the poet’s sentiments into musical language. The young bass does not allow the similarities between ‘La Poésie,’ an adaptation of verses by Édouard Pailleron, and Adolphe Adam’s familiar ‘Cantique de Noël’ to distract him from the originality of Flégier’s writing. Schwartz’s cognac-hued timbre, reminiscent of the voices of great French-speaking singers of prior generations like Heinz Rehfuss and René Bianco, flows through the music intoxicatingly, consonants lightly but effectively voiced. The depths of expression reached in Flégier’s handling of Jean Richepin’s text in ‘Au crépuscule’ are reflected in the expansiveness of the accompaniment, and Dibbern provides Schwartz with a profoundly eloquent palette upon which to mix the colors of the vocal line. The interaction between singer and pianist is a model of the art that conceals art, their collaboration having been refined to the point of seeming as much biological as artistic without sounding in any way artificial or studio-bound. ‘À la dérive,’ another Richepin setting, was esteemed highly enough in the Nineteenth Century to be included alongside songs by Gounod, Massenet, and Verdi in a volume entitled Classical Vocal Gems by the Best Modern Composers, published in Boston in 1892. As performed on this disc by Schwartz and Dibbern, the song’s appeal is immediately apparent. In Flégier’s exquisitely melancholic response to Richepin’s ‘Les Larmes,’ too, the bass’s voice drapes over the polished-marble pillars of Dibbern’s playing like rustic silk, the occasional blemish in the vocal fabric revealing not ruinous imperfection but heartening humanity. Unlike so many young singers, Schwartz has the good sense and the musicality to transform very minor lapses in intonation into fleeting moments of vulnerability that suit the lush textures of the music. The starkly descriptive text of ‘L’Homme et la Mer’ is drawn from Charles Baudelaire's seminal Les Fleurs du mal, one of the most influential collections of poetry published in the Nineteenth Century in any language, and the superb lyrical quality of Flégier’s setting is a testament not only to his skill as a composer but also to his acute perceptiveness as an interpreter of words. Schwartz and Dibbern heighten appreciation of the quality of Flégier’s music by exploring every recess of angst and ambiguity without overextending the dimensions of the music. The pair of Mélodies constructed from texts by René de Saint-Prest, ‘Le Manoir’ and ‘Ma coupe,’ occupy very different emotional landscapes, but the consistency of Dibbern’s playing, her phrasing always expertly matched to Flégier’s masterful mirroring of the flow of the text, aids Schwartz in limning the Mélodies’ differences solely by singing the music as written. The notes on the page serve singer and pianist well in the Armand Silvestre setting ‘Chant d’automne,’ as well, and they in turn craft a performance that is a splendid service to both composer and poet. ‘Apaisement’ is unique among the Mélodies recorded here in pairing the vocal line with an obbligato part for viola, delivered in this performance with warm tone and elasticity of line by Thomas Demer. The way in which Schwartz and Demer blend their sounds brings to mind the inner movements of Bach’s D-minor Concerto for two violins (BWV 1043) and Mozart’s Sinfonia concertante for violin, viola, and orchestra (K. 364/320d), their euphonious give and take enhancing the piquancy of Paul Verlaine’s words. Verlaine’s text again makes a strong impression in Schwartz’s singing of ‘Je ne sais pourquoi,’ the easy solidity of tone making the elegance of Flégier’s marriage of music with text all the more apparent. The most unusual of these Mélodies proves to be one of the most profoundly enjoyable: employing an excerpt from the writings of Saint Thomas Aquinas, ‘O salutaris’ is the kind of song that reaffirms that the simplest modes of musical expression are sometimes the most metaphysically complex. With their performance of the piece, Schwartz and Dibbern reaffirm that the same can be said of singing. ‘Less is more’ is a cute cliché, but in music it is too often cited as a justification for performances that are marred by musicians whose resources are not equal to the demands of the music. This is a concern that never materializes in the context of this disc. Schwartz and Dibbern lack nothing that Flégier requires of them, and in their ideally-scaled, richly imaginative performances of these thirteen Mélodies they give neither more nor less than the music needs. Every musical institutional whether educational or professional should demand and ensure that its constituents of all ages and levels of ability fully comprehend that impeccable vocalism is a component of but neither on its own constitutes nor is synonymous with good singing. Exasperatingly, great voices sometimes inhabit the bodies of idlers and idiots. Sometimes, too, remarkable techniques counterbalance and conceal the flaws in decidedly imperfect voices. For singers as much as for politicians, though, Abraham Lincoln’s wisdom is abundantly true: one might manage to fool some people all of the time and all people some of the time, it is impossible even now to deceive everyone all of the time. In his tenure at the Opéra de Paris, Ange Flégier likely learned this through observation, and perhaps this experience prompted him to compose Mélodies that offer performers nowhere to hide, vocally or artistically. In this age in which it sometimes seems that young singers are trained to think identically and to look and sound as impersonally interchangeable as possible, encountering a disc like this one and a developing artist like Jared Schwartz is an unexpected delight. How strange it seems that an intuitive young bass singing little-known but fascinating music beautifully and idiomatically might be interpreted as consciously ​daring to be different.